AI has evolved to encompass many sub-genres, including document management. In this white paper, explore how machine learning (ML), robotic process automation (RPA), and natural language processing (NLP) are revolutionizing the world of document management, and discover how an AI-infused document and contract management platform can help maximize your business potential. 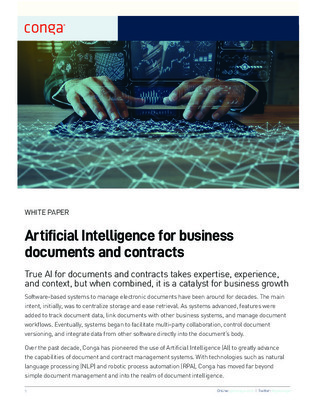 To learn more about the benefits of AI-infused document and contract management, download this white paper, and explore your software options with Conga.